So Citi finally started offering cash back deals with select merchants you may visit, but they sure aren’t making them easy to find. 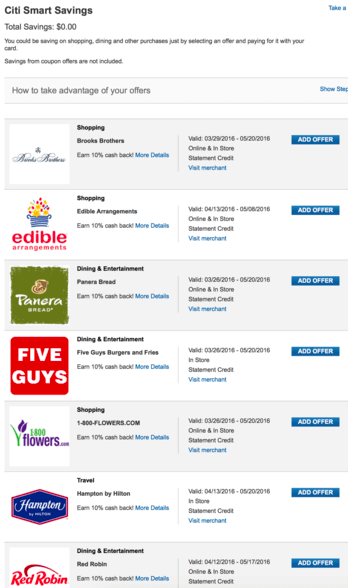 For example, those with an American Express card know where to find Amex Offers. They’re right there on the main page when you log in to your credit card management page. The same goes for Bank of America users. There are easily accessible cash back offers you can load to your BankAmericard to save 10% or more at places like Starbucks, AT&T, Bristol Farms, Red Robin, etc. I use the Bank of America cash back deals all the time…in fact, it’s probably the only reason I use the card to begin with since I earn more cash back with other cards I carry. So it’s a good thing they make their deals easy to find. Now let’s talk about Citi and their seemingly impossible to find “Citi Smart Savings” offers. Once you log in to the Citi credit card website you won’t see anything about any cash back offers. Instead, you’ll see your credit card(s) listed, the balance(s), minimum payment(s), etc. You’ll also see your ThankYou Points balance off to the right. That’s great but where are the cash back offers? If you click on “View More Offers” from within this section, you’ll be taken to the Citi Smart Savings area of the site, as pictured above in the screenshot. From there you can add targeted cash back offers to your Citi credit card(s) similar to the offers at Amex and Bank of America. I currently have Citi cash back offers for Red Robin, Five Guys, Panera, and some other spots tied to my Citi ThankYou Premier card. They’re all 10% cash back. Obviously these offers make your Citi card(s) much more attractive if you already shop at the merchants listed. It’s pretty hard to beat 10% cash back. By the way, if you don’t see the Get the Most From Your Cards section on the landing page once you log in at Citi, you can also find the Citi Smart Savings by clicking on “Card Benefits” on the menu at the top of the page. Once you click that you have to scroll down and click on “Offers For You” on the right sidebar. That link will take you to same place, the Citi Smart Savings dashboard. I don’t know why they make them so hard to find? Get Savings via the Citi Mobile App Too! If you’re using the Citi mobile app, they’ve now added an “Offers for You” link at the top of the screen once you’re logged on. It’s a lot more straightforward than the website but wasn’t visible until recently. You’ll see the same cash back offers there, but they’ll also tell you how far they are from your current location and allow you to map them. So if you’ve got a 10% cash back offer for Panera and want to use it, it’ll show you the nearest one relative to your present location. It took Citi a little bit longer than others in the industry to get these commonplace cash back offers going, and they’re still doing a decent job hiding them, but they’ll likely make them a lot more visible over time.